Fabulous Frogger: First finished project for 2012! 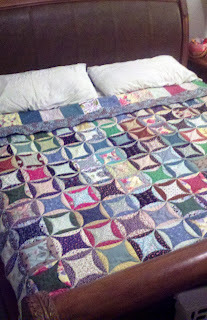 I finally finished the quilt I started in January....with my new sewing machine from Santa. The quilt pattern is Cathedral Window and I just love how it turned out! Now I'm off to plan my next sewing project! I have a good friend I'd like to make a lap quilt for, so now to find a pattern I like! For all those stitchers out there that rotate the pieces you work on, how/where do you keep all your projects? I stuff all mine into an old Coach purse I have (I love it, but it has some stains on it....but this is a great way to keep using it and not have to toss it!). I keep telling myself....if I can't fit it in the bag, I can't add it to my rotation of work. Luckily it's a HUGE bag!!. Looking forward to my 4 day weekend coming up! I'm taking Friday off to spend with my little girl, Kella. It's her birthday! and then Monday is a President's Day, which means NO WORK! I should definitely get some stitching done!! 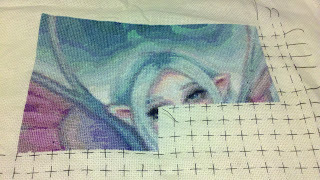 Your quilt is gorgeous and great progress on your wip. Your quilt looks so beautiful. You must be pleased with your new machine. Happy Birthday to Kella for the weekend. Your quilt is lovely. Great progress on Coral. I keep my wips in a magazine rack. That is a beautiful quilt. 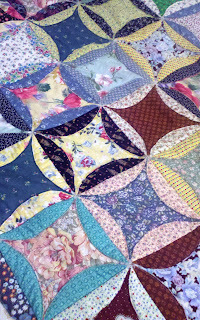 I am not a quilter, but I love seeing the work of others. Coral is looking good too. I keep my projects in a plastic container,in plastic bags, by my stitching chair and I have a handy zip sewing bag with handles for transporting small projects around. Gorgeous progress, enjoy your four day weekend! Wow! 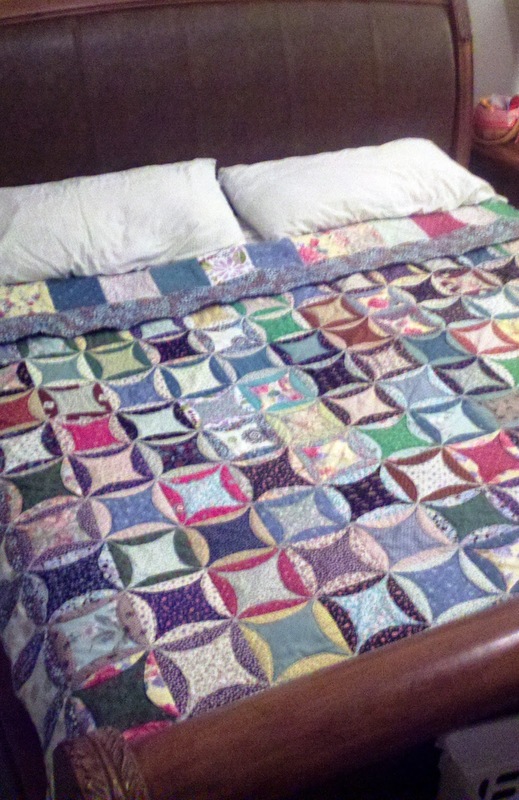 Your quilt looks great! Congratulations on a beautiful finish! I'm planning to make one as well. I'm still in the fabric gathering stage. Well, I'm still trying to figure out what colors I want to use too. Wow the quilt is gorgeous. Great Job! Love your stitching update. It's sure a beautiful piece. I put my To Do pile into a large tote basket and each piece in a large envelope. Just go to the link haha. It's hard to explain. woww your quilt is looking so beautiful..
stunning quilt :D I love your stitching! I keep my WIP wherever they end up but I only have 3 at most. I have a HAED, my boxers and a small project that can be carried around in my handbag and that's all otherwise Phill would kill me! Beautiful quilt and hope you had time to xstitch too! Your Coral is gorgeous.